The one who has had the opportunity of seeing this immense bird at work, by sure will be amazed at two things. The first, why ever it should be playing with those bones or parts of a skeleton of an old carcass, taking them up into the sky and then leaving them falling as a dead weight on spikes of rock, hitting them with the precision of a plane bomber. Then, the immense wingspan that turns the common ravens, its usual disturbers, in small birds of insignificant size that go flickering around this giant of the air. If we were in the Iberian Peninsula, the first dilemma would be partly resolved. Over there the bearded vulture is called respectively quebrantahuesos in Spanish and quebra-ossos in Portuguese, two names rather self-explanatory translatable in bonecrusher, but also in this case they do not fully explain the reason of this act. The bearded vulture is the only bird in the world nourishing of bones and of their contents, the marrow, an ultra proteinic food that can give nourishment to this bird of exceptional size. The game of throwing the bones from above serves only to break them and thus render them swallowable. With regard to the second wonder, this lies in the fact that this bird is one of the greatest flying beings present on our planet, with a wingspan that may reach the 280 cm. It is second only to few others. To the Andean condor (Vultur gryphus) and to some albatrosses (Diomedea sp.). The Bearded vulture or Lammergeier (Gypaetus barbatus Linnaeus, 1758) belongs to the order of the Accipitriformes and to the family of the Accipitridae and is the only species belonging to this genus. It is not a real vulture but rather an eagle with some vulture characteristics. 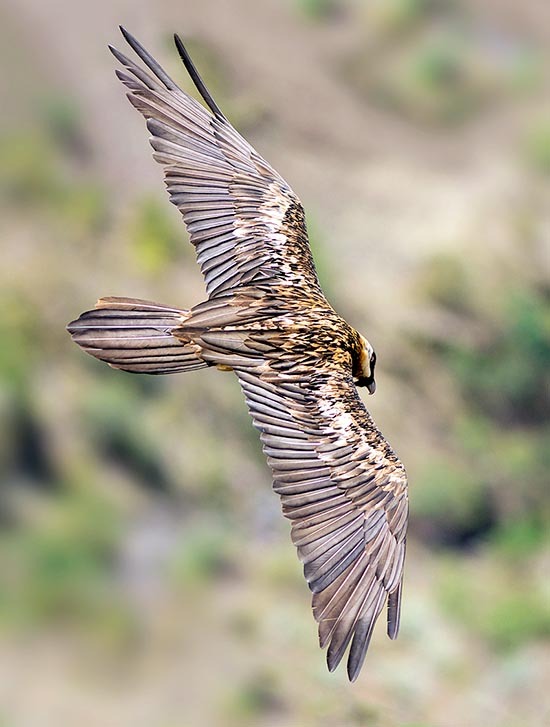 The flight is elegant and light with turns and dives typical of a hunting raptor, with movements of the long tail suitable for steering and maneuvering in the strong winds blowing at the altitudes it frequents and much more slender wings like a falconiform. Conversely, the legs and the type of feeding connect it to the vultures. 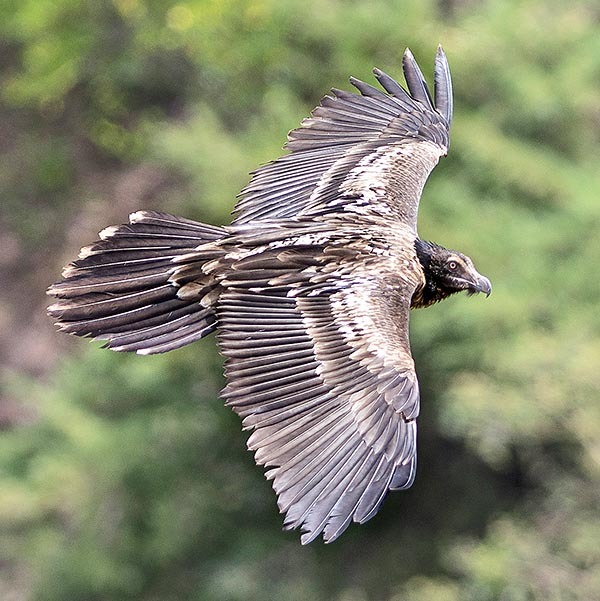 Furthermore, this double characteristic renders it capable of taking off, contrary to the vultures, very early in the morning, and of being able to remain flying along the whole day as it knows how to take advantage of the slope updrafts, typical of the mountain areas where it lives. This characteristic is already shown in the scientific name given by Linnaeus who wanted to indicate with Gypaetus the combination of the two characteristics. “Gyps” from “gups” = vulture in Greek and “aetos” = eagle. Conversely, the species barbatus comes from the Latin, due to the typical and long bristles this bird has at the base of the beak and on the chin. 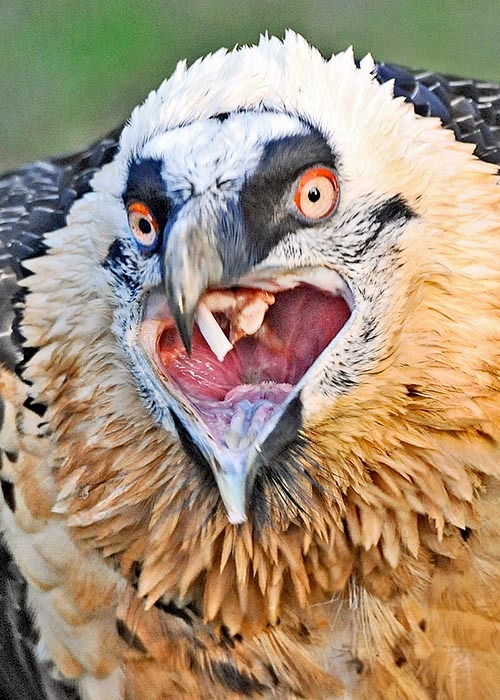 Many are the vulgar names given to the bearded vulture, often taken from the morphological characteristics, or, as we have seen before, its feeding habits. Avvoltoio barbuto, avvoltoio di montagna, avvoltoio aquila, avvoltoio d’oro, falco barbuto, avvoltoio degli agnelli e gipeto in Italian, Lämmergeyer in German, Lammergeier or Bearded vulture in English and Gypaéte barbu in French. In their turn, also the Anglo-Saxon and North-European terms come from the union of the names “Lamm” = lamb and “geier” = vulture. 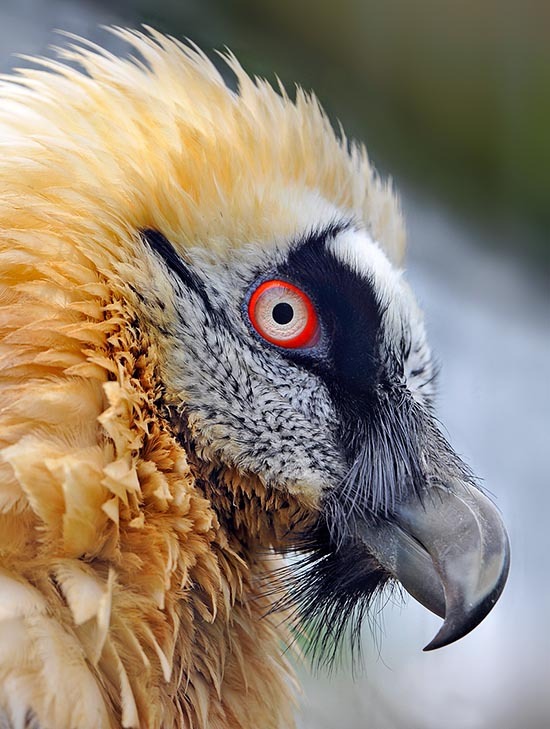 The bearded vulture is a typical inhabitant of the high Euro-Asian and African mountains. Once diffused on every European mountain ranges, then systematically extirpated due to the strong anthropic pressure, the merciless hunt and the change in the pastoral activity, has seen nowadays its range reducing to the Asian mountain ranges, to the Pyrenees, to Turkey, Ethiopia and to the east African highlands up to South Africa. Some populations live in the Atlas Mountains in Morocco, Algeria and Tunisia, then in some mountains in southern Egypt and rare specimens in Yemen. Nowadays disappeared in Sardinia, is still present in Corsica. Through the Asian mountain ranges it reaches Mongolia on the very cold Altay Mountains where has a considerable stronghold in the famous Yolin Am (the Valley of the Eagles). Here it is still hunted and it is tradition to expose it stuffed at the entrance of the ger, the traditional tents of the Mongolian nomads. A good population is present in the Ethiopian highlands. Several attempts of reintroduction have been done in the Alps on the French side as well as on the central one and the first successes are taking place. Similar projects are being carried out in Spain, in the Cantabrian Mountains and Cazorla Range, where, recently, reproductive success has already been achieved. The bearded vulture is a sedentary bird and is very attached to its nidification aera that hardly leaves even if for short periods. However, despite being a solidly resident bird, it gets during the period of sexual immaturity, rather long in the bearded vulture, a moderate wandering that may lead it even in raids of some hundred of kilometres flying over plains rich of herds of ungulates and pre-desert zones frequented by herds of ovines and caprines where, even if supported by the high presence of preys, they have never settled and invariably return to the native area. 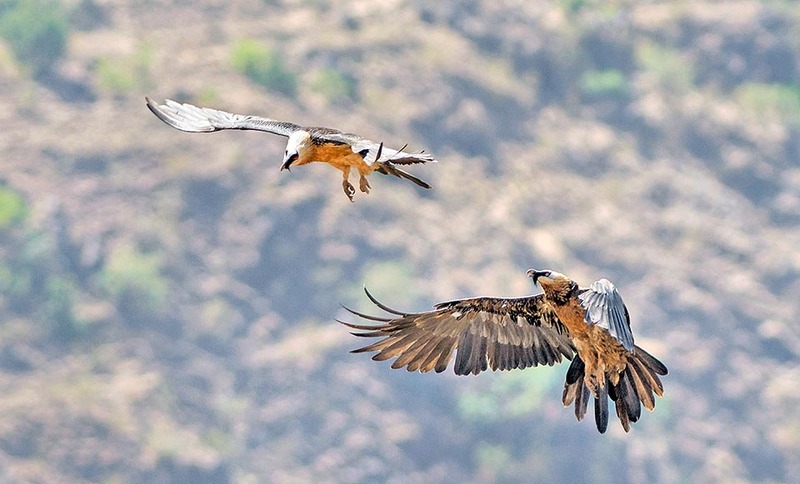 The environment frequented by the lammergeier is by sure one of the hardest for surviving. High mountains often with perpetually snowy peaks, desolate and rock valleys, chilly temperatures, lack of oxygen and remarkably bleak environment but very open to allow a vast aerial control of the territory. In Asia, it nidifies up to more than 4000 m of altitude, altitudes that in Europe and Anatolia decrease occasionally even under the 2000. Also the areas subject to high snowy coverage that would appear harsh for the permanence of a bird having food needs of some significance, are for this vulture a remarkable source of food reserves. Nourishing in particular of carcasses of wild ungulates, in the thawing phase the snow cover reveals the corpses of those animals died during the bad season or accidentally fallen from the ravines during the winter. The bearded vulture is an incredibly big bird. It is up to 120 cm long, with a weight up to 7 kg and an impressive wingspan of 280 cm. The tail is wedge-shaped and in the silhouette when flying it is very prominent and quite long for a vulture, the feathers of the tail exceed easily the 40 cm of length. Also the body is slender and quite different from the squat and massive trunk typical of the vultures. The beak is strong and hooked but not in condition of tearing off the flesh from the carcasses, as well as the feet, quite different and weaker than those of its consimilars but able to clench and carry objects when flying. The wings are very pointed and like a falconid with very long remiges that prove very effective in their typical soaring flight. The sexual maturity of the bearded vulture is reached after the sixth age and the livery consequently gets different shades during this period, however there is no dimorphism between the sexes and the distinction may happen only through specific genetic analyses. The typical adults’ livery emphasizes the cream white body and the neck and a grey blackish alar cover. The ventral part is often more or less reddish and it is thought that this is due to the habit of this bird in taking baths of laterite, a soil rich of aluminium and iron salts that indelibly colours the feathers of the bird. The head is white with two black bands that from the beak reach the line of the eyes formed by silky vibrissae that reappear like a tuft, on the lower mandible of the beak. The eye is yellow surrounded by a very evident bright red ring that accentuates even more when the bird is in the throes of excitement or alarm. Initially, the young have a blackish lineage all over the body, with slight golden reflections on the wings. They already have the adults’ characteristic bristles and also the eyes begin to get the typical adults’ colouration but only gradually, year after year, they will be able to get the final adult livery. Three subspecies have been classified, each of which occupies a specific area of the vast occupied territory and show among them slight differences in size and in some case in the livery. The Gypaetus barbatus aureus, typical of Asia and diffused on the the mountain ranges of Hindukush, Karakorum and Himalaya, the Gypaetus barbatus barbatus, diffused in Europe, in the rest of Asia and in North Africa and the Gypaetus barbatus meridionalis, diffused in Ethopia, eastern and southern Africa. It was reported that in order to get food, this big bird often takes advantage from its big size by attacking live animals with a technique used also by the Golden eagle (Aquila chrysaetos). Not having suitable claws for attacking live preys, moreover large, here it seems having developped a hunting modality that sees it profiting more its big size than the strength. With continuous dives it is said to be able to push the young chamoises, steinbocks or wild goats to the edge of precipices where, with a last wing beat, makes them fall into the void. Whereupon, it patiently waits for other predatos, foxes, jackals or other necrophages to eat the flesh abandoning as leftover what is its choice food, the gnawed skeleton. They have observed bearded vultures nourishing of terrestrial turtles, giving them the same aerial treatment offered to the bones. In some areas such as the Ethiopian highlands it often visits also the urban landfills while looking for food. The bearded vulture swallows directly up to 30 cm long bones but must break the longer ones to reduce them to measures suitable for being swallowed. This vulture does not have the typical goiter as this is not necessary for this type of feeding. The oesophagus wall of the bearded vulture is covered by a layer of much hardened keratin that avoids wounds during the deglutition and the stomach produces highly acid gastric juices capable of dissolving the salts contained in the bones. The proof of the uniqueness of its stomach is easily found by observing the behaviour of other species of birds of prey, in particular the strigids that solve the problem of the bones, even the smallest ones swallowed with the preys, only vomiting them through the wads. It was calculated that the average requirement of a single specimen of bearded vulture adult is of at least of two carcasses per month, therefore the hunting territory must be necessarily vast and able to guarantee such a quantity of food. Clearly, with the forming of the couple and with a hungry chick in the nest, the demand increases proportionally. So, it is evident that the disappearance from certain areas once frequented by this bird, is often due, besides the merciless hunting, by the decrease of available prey following modifications to the high mountain shepherding or by the reduction of the local wild fauna. To this we have to add the continuous expansion of the tourism in its usual territories, with a continuous disturbance that does not facilitate its presence. The nidification of the bearded vulture is at times standoffish and by sure is condioned by the availability of food. Furthermore, the complete cycle engages the couple for almost one full year. The couple is stable and monogamous though the cases of polyandry are not rare and it seems that the presence of these intruders leads to a greater reproductive success. Already in late autumn, for the couples of the boreal hemisphere, begin the courting flights and the choice of the nidification site. The bearded vulture nidifies on steep rocks not accessible from the ground and well protected against any possible aerial attack. Usually, it is placed on a ledge suspended even at several hundred of metres from the soil and often in deep hollows that guarantee also a shelter against the adverse weather conditions. 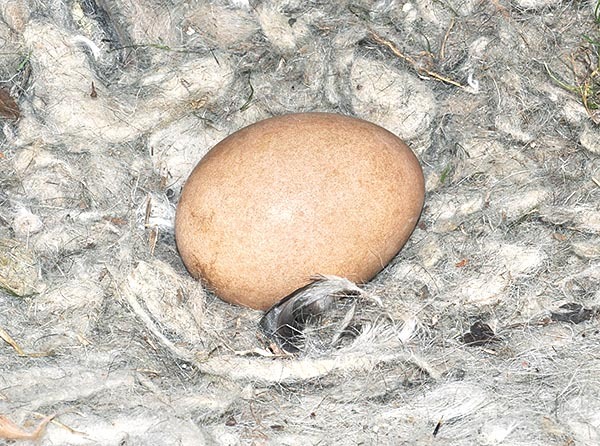 The nest is a platform of remarkable size, built by overlapping big branches and boughs and lined inside by wool and very soft material the bearded vulture looks for with attention during its air raids. In the area are built more nests and alternatively they are chosen year after year. 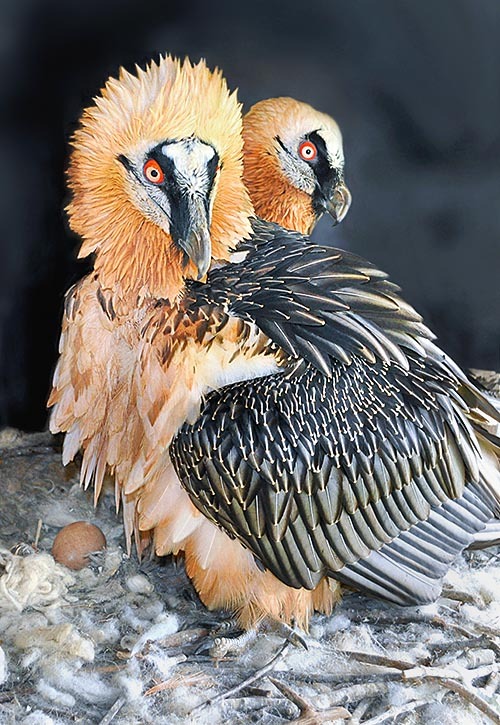 The bearded vulture usually lays two eggs, rarely three, but usually only one chick manages to survive. As is the case in some species of eagles, in fact we assist to cainism among the chicks that leads inevitably to the death of the weakest specimen. The big eggs are of cream colour with ochre spots, are brooded for 55-60 days almost mainly by the female and hatch, in the boreal hemisphere, usually in the period of the snow melting, rightly in the moment when reappear the carcasses of the animals passed away during the bad season and consequently rich of foods. The chicks are nourished during the very first days with small chunks of meat and fibrous material but almost immediately they begin to swallow small bones bigger and bigger as they grow. 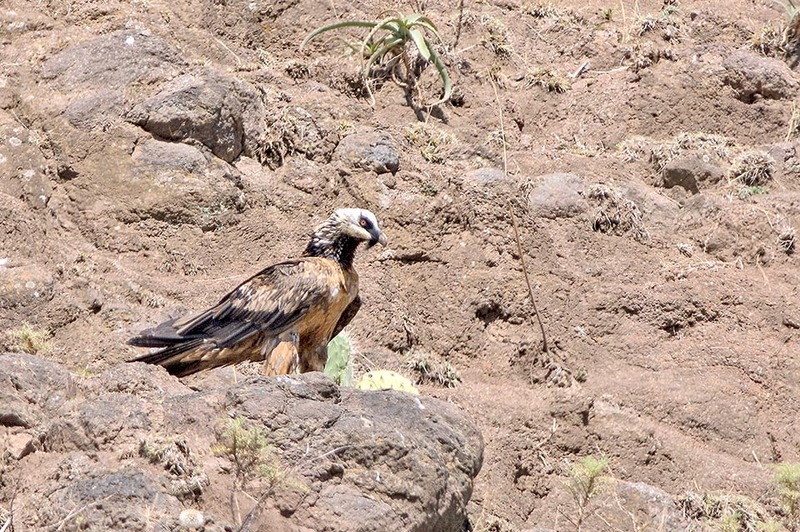 The staying in the nest of the small bearded vulture is widely exceeding the 100 days, at times even 130, after which it remains linked to the parents for some more months though being able to nourish autonomously. It leaves the family when the parents begin the courting for the next nidification. The lifespan of the bearded vulture is very long and in captivity it may reach the 40 years of age and it’s a very strong and resistant bird and can stay even for several days without feeding. It has suffered and is still suffering anthropic pressures, sometimes alarming, especially in Asia where some populations in particular in Nepal, subject it to seizure of the chicks from the nests for an unlawful trade or even for consuming their entrails and some organs, considered as a miraculous potion in the local traditional medicine. 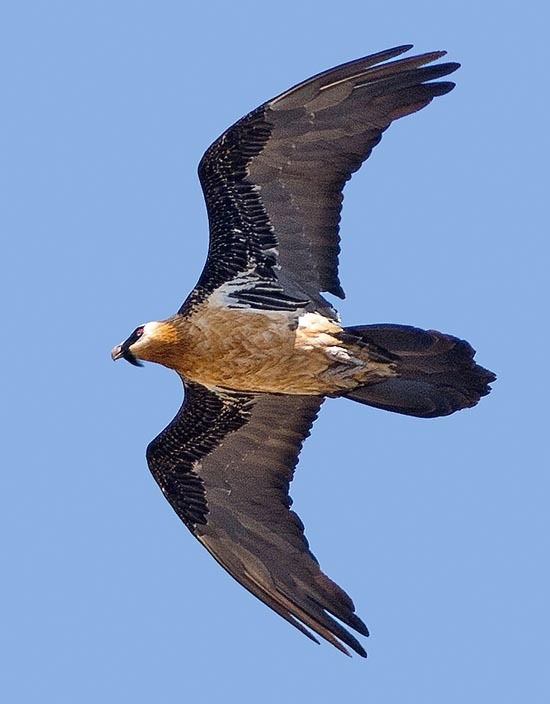 In the western world, where at times the zootechnical medicine has been subjected to pharmacological excesses, the bearded vulture, together with other vultures, has remained indirectly involved and unfortunately victim of the introduction of the Diclofenac and other powerful drugs causing numerous deaths. In Europe where has arrived close to the limit of the extinction, is now highly protected and new reintroduction initiatives are now implemented. However, thanks to the vast range occupied, it is not considered as an endangered species.